1. Preheat the oven to 200°C, gas mark 6. Unroll the pastry sheet and place on a large baking tray. 2. Scatter over the pear and apple slices, leaving a 1cm border round the edges. Crumble over the cheese and add the walnuts. Drizzle with balsamic glaze and bake for 20 minutes until golden. 3. Meanwhile, remove any thick stalks from the kale, mix with the oil and season. Spread out on a large baking tray and bake for 8-9 minutes until crispy. 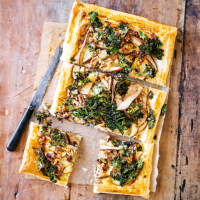 Serve the tart topped with the crispy kale crisps.